Thomas Höllmann’s first love was art, but decided to study Chinese. It was certainly a good choice, for he is now one of the best-known sinologists of his generation – and the newly elected President of the Bavarian Academy of Sciences. Perhaps not surprisingly, the notion of writing a cultural history of Chinese cuisine was conceived in a restaurant. But it was a French restaurant in which Professor Thomas O. Höllmann, the current President of the Bavarian Academy of Sciences, was dining with his publisher. The idea was more in the nature of a joke, Höllmann says, but it soon took on clearer contours – and a fortnight later he was commissioned to write such a history. In the scholarly literature on Chinese history and civilization, this topic had inexplicably been ignored up until then, and the result of his labors fills this gap. The book Schlafender Lotos, trunkenes Huhn, written for a wide readership, which has appeared meanwhile in both English (as The Land of the Five Flavors) and Chinese versions (as 五味之地) looks at selected periods in Chinese history from the earliest times up to the present, and investigates the changes in eating habits, culinary practices and attitudes to food that took place in various parts of the country. In doing so, it also affords insights into the culinary elements of the daily lives of emperors and aristocracy, and of the Chinese peasantry. However, Höllmann is quite accustomed to taking a broad view of his subject. He originally intended to study Asian Art, and his parents were relieved when he finally decided on Sinology. “Although I’m pretty sure they had only a vague idea of what the term meant, they obviously regarded Sinology as a better bet than Art,” he recalls. So one might say that his choice of Sinology was the upshot of a number of diversions, and perhaps that explains why he has approached the study of Chinese culture from such a wide variety of angles, rather than focusing on a clearly defined set of research problems. “I have always selected topics which I felt it would be fun to explore.” As a result, his work covers a broad spectrum of issues, ranging from studies of ethnic minorities in China to Chinese calligraphy and the Silk Road. He very much appreciates the fact that the profile of his academic chair at LMU has given him the freedom to study China’s enormous diversity from a wide range of viewpoints. “This would not be possible in an American university, for instance,” he says. “In the US you have the choice between Chinese History and Chinese Literature. 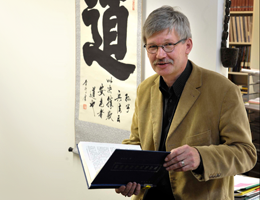 Both fields are defined by their specific methodologies and there is no focus on any particular region of China.” Thomas Höllmann celebrated his 65th birthday in February, and is now an Emeritus Professor at LMU. But he intends to remain scientifically active nevertheless: “I don’t need much – a computer, access to a well-stocked library and a desk.” Moreover, in the coming three years, a new task awaits him – as President of the Bavarian Academy of Sciences.